PURPOSE: The purpose of this study is to compare the efficacy of topical cyclosporine (Cs) 0.05% alone and topical Cs 0.05% with loteprednol 0.5% in patients with moderate dry eye. STUDY DESIGN: This was a comparative, prospective, interventional study. PATIENTS AND METHODS: A total of 140 patients diagnosed with moderate dry eyes were randomly divided into two groups. Group A patients received treatment with topical loteprednol 0.5% started as QID dosage for 2 weeks and tapered to BID dosage over the next 6 weeks, topical Cs 0.05% BID and artificial tears. Group B patients received treatment with topical Cs 0.05% BID and artificial tears. All patients were followed over a period of 6 months with ocular surface disease index (OSDI) questionnaire, tear film break up time (TBUT), corneal fluorescein, and lissamine green staining scores. RESULTS: There was a significant difference in the symptoms and signs of dry eye in the group receiving combination of loteprednol 0.5% and Cs 0.05% as compared to the group receiving Cs alone evident by greater reduction in OSDI score, corneal staining, and improvement in TBUT and Schirmer's test values over a follow-up of 6 months. CONCLUSION: Combination therapy with topical loteprednol and Cs is significantly better than topical Cs alone on alleviating symptoms and signs in moderate dry eye patients. Dry eye is a multifactorial disease of the tear film and ocular surface that results in symptoms of discomfort, visual disturbance, tear film instability with potential damage to the ocular surface. It is associated with increased osmolarity of the tear film and ocular surface inflammation. Hospital-based studies in population from Northern and Eastern India showed that the prevalence of dry eye varies between 18.4% and 40.8%.,,, Tear hyperosmolarity and tear film instability are central in the pathogenesis of dry eye. Tear hyperosmolarity leads to increased inflammation and damage to the ocular surface. Mild dry eye cases can be managed by tear supplementation, but artificial tears alone are not effective for moderate and severe dry eye cases as the basic pathology is not targeted. Anti-inflammatory agents should be the first-line agent for dry eye as ocular surface inflammation is central to the pathogenesis of dry eye. A positive response with topical steroids in moderate and severe dry eye has been repeatedly shown by various studies. Topical steroids use leads to subjective improvement as well as reduction in corneal fluorescein staining and expression of inflammatory markers.,,,, Prolonged use of topical steroids, however, is limited by adverse effects such as cataract formation and raised intraocular pressure (IOP). Role of topical steroids in dry eye has also been extensively studied from time to time. Low potency steroids such as loteprednol reduce ocular surface inflammation and improve symptoms of the moderate-to-severe dry eye without causing significant IOP elevation as compared to high potency steroids such as prednisolone or dexamethasone., Tear film osmolarity and levels of inflammatory cytokines are seen to reduce after initiating treatment with topical loteprednol. However, the long-term use of loteprednol is limited by side effects like raised IOP and cataract formation although not so much as potent corticosteroids. Topical steroids treatment in dry eye secondary to Sjogren's syndrome or hematopoietic stem cell transplantation shows faster symptomatic improvement and may be as effective as Cs., Adverse effects of steroids particularly after prolonged treatment and with potent agents such as prednisolone have always been a concern. Short-term use of methylprednisolone in combination with Cs is documented to show better improvement in symptoms in a small study group. The current study was undertaken to evaluate whether combination therapy of loteprednol in tapering dosage and Cs is better in alleviating signs and symptoms of moderate dry eye when compared to Cs monotherapy. Since both drugs have a different mechanism of action, the combination could be more effective than monotherapy by either. This was a comparative, prospective, interventional study that was conducted over a period of 18 months (IRB No. IEC/VMMC/SJH/Thesis/October-2014/396). One-hundred-and-forty patients with moderate dry eye disease satisfying the study criteria were randomly divided into two groups of 70 each. 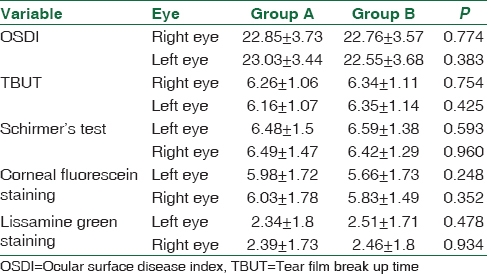 Both the groups had comparable baseline parameters, and there was no statistically significant difference between the two groups in terms of ocular surface disease index questionnaire (OSDI) scores, tear film break up time (TBUT) values, Schirmer's test values, corneal fluorescein staining scores, and lissamine green conjunctival staining scores [Table 1], [Table 2], [Table 3]. Randomization was done by using table of random numbers. Group A patients received treatment with topical loteprednol 0.5%, topical Cs 0.05%, and artificial tears. Group B patients received treatment with topical Cs 0.05% and artificial tears. Topical loteprednol 0.5% was given for 8 weeks, started as QID for the first 2 weeks and tapered to BID dosage for 3rd to 8th week, and topical Cs 0.05% was given in BID dosage for 3 months in both the groups. All patients were provided with a patient information sheet and written informed consents were taken before commencing the study. Approval of the Institute's Ethics Committee was obtained before starting the study. Patients diagnosed as cases of moderate dry eye disease (according to Dry Eye Workshop, 2007 classification) were enrolled for the study [Table 4]. Patients above 18 year of age diagnosed with moderate dry eye and who were not wearing contact lenses for at least 1 month before the study and agree not to wear the same during the study period were included in the study. Patients with a history of Steven–Johnson syndrome or ocular pemphigoid, those having punctual plugs or cautery or any intraocular surgery in the past 3 months, pregnant or lactating women or those on oral contraceptive pills, patients on anti-glaucoma medications, those with unstable diabetes mellitus and patients allergic to study medications were excluded from the study. Patients having a history of topical steroid or Cs within 1 month were also excluded from the study. Patients who could not complete 6 months of follow-up were also excluded from the study. Meticulous history was taken and patients were evaluated for symptoms such as foreign body sensation, grittiness, irritation, burning sensation, itching, redness, photophobia, blurred vision, discomfort, and fatigue. OSDI questionnaire was used for grading the severity of dry eye. This questionnaire consists of 12 questions and is graded on a scale from 0 to 100. OSDI score of 16–30 was included for the diagnosis of moderate dry eye disease. A thorough examination of the anterior and posterior segment was done. Tear film was examined for evaluation of meniscus height or presence of any tear film debris. Lissamine green staining inspection, NEI scale: Conjunctival staining was recorded for three areas each of temporal and nasal conjunctiva of each eye and graded 0–3 as above for each zone with a maximum score of 18. Score 1–7 was included in our study. All patients were followed at 2 weeks, 6 weeks, 3 and 6 months. Compliance to treatment regimen was ensured at each follow-up visit by history taking and by looking at number of vials of medicine consumed. Categorical variables were presented in number and percentage (%), and continuous variables were presented as mean ± standard deviation and median. Normality of data was tested by Kolmogorov–Smirnov test. If the normality was rejected, non parametric test was used. Quantitative variables were compared using Unpaired t-test/Mann–Whitney test (when the data sets were not normally distributed) between the two groups and Wilcoxon ranked sum test (as the data was nonparametric) between pre and post. Qualitative variables were correlated using Chi-square test/Fisher's exact test. P < 0.05 was considered statistically significant. The data were entered into Microsoft Excel (Microsoft Corp., Seattle, WA, USA) spreadsheet, and analysis was done using Statistical Package for Social Sciences version 21.0 Inc., Chicago, IL, USA. This was a comparative, interventional study to compare the effect of topical Cs 0.05% alone versus topical loteprednol 0.5% and topical Cs 0.05% in the treatment of moderate dry eye disease. This study was conducted over a period of 18 months. A total of 140 patients diagnosed as cases of moderate dry eye disease (according to Dry Eye Workshop, 2007 classification) were enrolled for the study. They were randomly divided into two groups of 70 each. Group A patients received treatment with topical loteprednol 0.5%, topical Cs 0.05% and artificial tears. Group B patients received treatment with topical Cs 0.05% and artificial tears. Mean age in group A was 44.4 years, with age ranging from 25 to 68 years. Mean age in Group B was 44.64 years, with age ranging from 23 to 69 years. OSDI score reduced in both the groups; however, there was no significant difference in the OSDI score between two groups at 6 weeks. There was, however, a significant difference in the OSDI score at the end of 3 and 6 months with group A showing better resolution of symptoms P = 0.002 and P < 0.0001 at 3 months and 6 months, respectively [Table 5]. TBUT improvement was seen in both groups at 2 weeks and onwards. Improvement in TBUT values was more in Group A but was statistically significant only after 3 months [Table 6]. Fluorescein and lissamine staining of the ocular surface reduced significantly in both groups, and the reduction was more in Group A, which was statistically significant at 3 and 6 months of follow-up [Table 7] and [Table 8]. Shirmer's test values were significantly better in the Group A starting from 6 weeks of follow-up and persisting till 6 months [Table 9]. There was no significant rise of intraocular pressure in any of the patients receiving topical loteprednol over observation of 6 months. Our study results showed that combination therapy with topical loteprednol and topical Cs drops had a better outcome than topical Cs drops alone in patients with moderate dry eye disease. OSDI score, corneal staining score with fluorescein, and conjunctival staining score with lissamine green all showed a significantly greater reduction in the group receiving both topical Cs and topical loteprednol than those receiving topical Cs alone at 3 and 6 months of follow-up. Schirmer's test values were significantly better in Group A at 6 weeks, 3 and 6 months. TBUT score was significantly better in group A at 3 and 6 months. Most common side effect reported by the study subjects was a stinging sensation in eye and hyperemia. These side effects were less in the group receiving combined treatment as compared to those receiving Cs alone resulting in a better adherence to treatment. Although loteprednol drops were tapered and stopped at 8 weeks, improvement in OSDI score, Schirmer's, TBUT, and staining scores continued in the combined treatment group. This could be due to lesser side effects experienced by these patients and therefore better compliance to treatment. Sheppard et al. reported the similar results with the use of loteprednol drops before use of topical Cs in the treatment of chronic dry eye. Our study further confirms the results of the previous study. Inflammation plays a key role in the pathophysiology of dry eye apart from tear film hyperosmolarity. Increased cytokine production, activation of T-cells, and matrix metalloproteinase lead to apoptosis of cells on the ocular surface. Cs is an immunosuppressive drug that inhibits T cell activation by inhibiting calcineurin thereby decreasing inflammation. Efficacy and safety of topical Cs in moderate-to-severe dry eye disease has been demonstrated by multiple studies. Steroids reduce inflammation by reducing the production of arachidonic acid derivatives, prostaglandins, and leukotrienes. Since the anti-inflammatory mechanisms of Cs and steroids are different, their combination can be better than either of them. Addition of a mild steroid, like loteprednol, can suppress inflammation as well as reduce the side effects of Cs drops such as stinging and ocular redness. Our study recommends to start treatment with a combination of low-dose topical steroid such as loteprednol and topical Cs along with topical tear substitutes in patients with moderate dry eye and taper the steroid over a period of 6–8 weeks while continuing topical Cs. This treatment regimen results in better resolution of symptoms of dry eye and minimal side effects of Cs thus ensuring better compliance. Further studies need to be done with a longer follow-up period as the follow-up period in our study was limited to 6 months. Combination therapy with topical loteprednol and cyclosporine is significantly better than cyclosporine alone in alleviating signs and symptoms of moderate dry eye. Clearance for commencing the study was taken from the Ethical Committee of Vardhaman Mahavir Medical College and Safdarjung hospital. All patients provided written informed consent before enrolling in the study and were provided with a patient information sheet. Gupta SK, Gupta V, Joshi S, Tandon R. Subclinically dry eyes in urban Delhi: An impact of air pollution? Ophthalmologica 2002;216:368-71. Sahai A, Malik P. Dry eye: Prevalence and attributable risk factors in a hospital-based population. Indian J Ophthalmol 2005;53:87-91. Gupta N, Prasad I, Jain R, D'Souza P. Estimating the prevalence of dry eye among Indian patients attending a tertiary ophthalmology clinic. Ann Trop Med Parasitol 2010;104:247-55. Basak SK, Pal PP, Basak S, Bandyopadhyay A, Choudhury S, Sar S. Prevalence of dry eye diseases in hospital-based population in West Bengal, Eastern India. J Indian Med Assoc 2012;110:789-94. Stern ME, Schaumburg CS, Pflugfelder SC. Dry eye as a mucosal autoimmune disease. Int Rev Immunol 2013;32:19-41. Coursey TG, de Paiva CS. Managing Sjögren's syndrome and non-Sjögren syndrome dry eye with anti-inflammatory therapy. Clin Ophthalmol 2014;8:1447-58. Pflugfelder SC. Antiinflammatory therapy for dry eye. Am J Ophthalmol 2004;137:337-42. Avunduk AM, Avunduk MC, Varnell ED, Kaufman HE. The comparison of efficacies of topical corticosteroids and nonsteroidal anti-inflammatory drops on dry eye patients: A clinical and immunocytochemical study. Am J Ophthalmol 2003;136:593-602. Lee HK, Ryu IH, Seo KY, Hong S, Kim HC, Kim EK. Topical 0.1% prednisolone lowers nerve growth factor expression in keratoconjunctivitis sicca patients. Ophthalmology 2006;113:198-205. Marsh P, Pflugfelder SC. Topical nonpreserved methylprednisolone therapy for keratoconjunctivitis sicca in Sjögren syndrome. Ophthalmology 1999;106:811-6. Pflugfelder SC, Maskin SL, Anderson B, Chodosh J, Holland EJ, De Paiva CS, et al. Arandomized, double-masked, placebo-controlled, multicenter comparison of loteprednol etabonate ophthalmic suspension, 0.5%, and placebo for treatment of keratoconjunctivitis sicca in patients with delayed tear clearance. Am J Ophthalmol 2004;138:444-57. Barber LD, Pflugfelder SC, Tauber J, Foulks GN. Phase III safety evaluation of cyclosporine 0.1% ophthalmic emulsion administered twice daily to dry eye disease patients for up to 3 years. Ophthalmology 2005;112:1790-4. Stevenson D, Tauber J, Reis BL. Efficacy and safety of cyclosporin A ophthalmic emulsion in the treatment of moderate-to-severe dry eye disease: A dose-ranging, randomized trial. The cyclosporin A phase 2 study group. Ophthalmology 2000;107:967-74. Tang-Liu DD, Acheampong A. Ocular pharmacokinetics and safety of ciclosporin, a novel topical treatment for dry eye. Clin Pharmacokinet 2005;44:247-61. Levy O, Labbé A, Borderie V, Laroche L, Bouheraoua N. Topical cyclosporine in ophthalmology: Pharmacology and clinical indications. J Fr Ophtalmol 2016;39:292-307. Egorova GB, Mitichkina TS, Fedorov AA, Shamsudinova AR. Topical cyclosporine for the treatment of ocular surface changes in contact lens wearers. Vestn Oftalmol 2015;131:36-42. Torricelli AA, Santhiago MR, Wilson SE. Topical cyclosporine a treatment in corneal refractive surgery and patients with dry eye. J Refract Surg 2014;30:558-64. Chung YW, Oh TH, Chung SK. The effect of topical cyclosporine 0.05% on dry eye after cataract surgery. Korean J Ophthalmol 2013;27:167-71. Sheppard JD, Comstock TL, Cavet ME. Impact of the topical ophthalmic corticosteroid loteprednol etabonate on intraocular pressure. Adv Ther 2016;33:532-52. Villani E, Garoli E, Termine V, Pichi F, Ratiglia R, Nucci P, et al. Corneal confocal microscopy in dry eye treated with corticosteroids. Optom Vis Sci 2015;92:e290-5. Lee JH, Min K, Kim SK, Kim EK, Kim TI. Inflammatory cytokine and osmolarity changes in the tears of dry eye patients treated with topical 1% methylprednisolone. Yonsei Med J 2014;55:203-8. Lin T, Gong L. Topical fluorometholone treatment for ocular dryness in patients with Sjögren syndrome: A randomized clinical trial in China. Medicine (Baltimore) 2015;94:e551. Boynton GE, Raoof D, Niziol LM, Hussain M, Mian SI. Prospective randomized trial comparing efficacy of topical loteprednol etabonate 0.5% versus cyclosporine-A 0.05% for treatment of dry eye syndrome following hematopoietic stem cell transplantation. Cornea 2015;34:725-32. Byun YJ, Kim TI, Kwon SM, Seo KY, Kim SW, Kim EK, et al. Efficacy of combined 0.05% cyclosporine and 1% methylprednisolone treatment for chronic dry eye. Cornea 2012;31:509-13. Sheppard JD, Donnenfeld ED, Holland EJ, Slonim CB, Solomon R, Solomon KD, et al. Effect of loteprednol etabonate 0.5% on initiation of dry eye treatment with topical cyclosporine 0.05%. Eye Contact Lens 2014;40:289-96.